All photos by Erik Gauger. 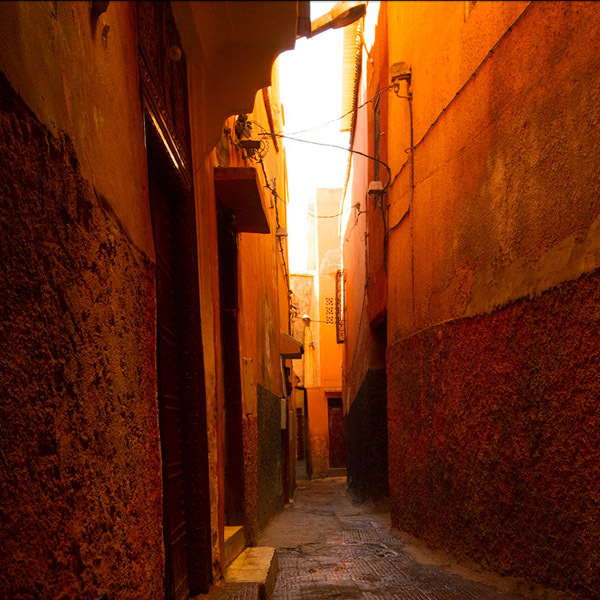 Erik Gauger, the illustrator behind Notes on the Road (one of our ), wanders the enchanting labyrinth of Marrakech's old city and is struck by the color (and scent! and taste!) of orange. 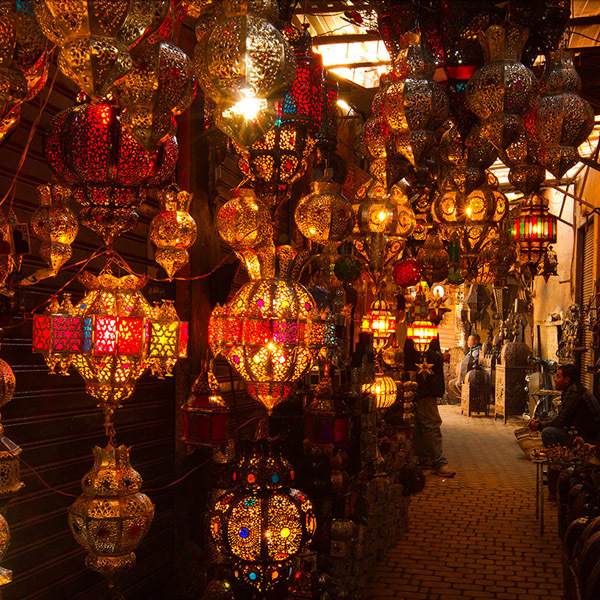 MARRAKECH – I wake up in the morning in a traditional riad that's tucked away at the end of a long, dark pedestrian alley in the old medina. The staff have lit incense, scenting the small three-story Moroccan courtyard. I set out on an exploration of orange. Here in Marrakech, the fruit, the scent, and the color orange is prolific and profound. 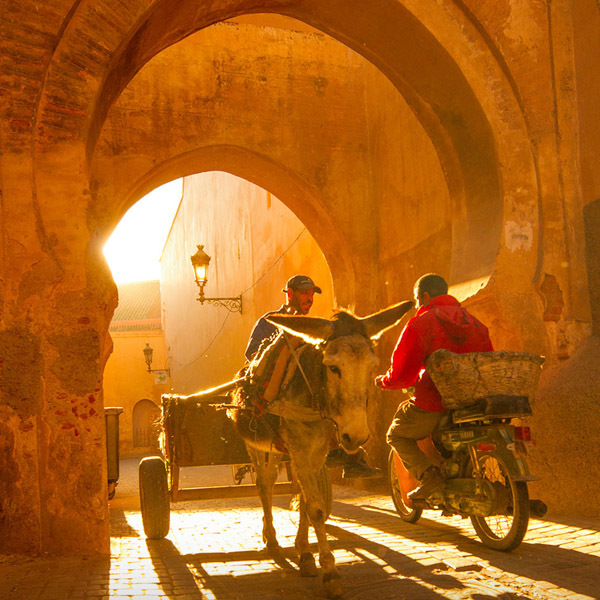 The old city, inside thousand-year-old walls, is the busiest place in Africa, but on a crisp, sunny morning, the labyrinthine back alleys appear empty. I arrived at my five-bedroom riad last night. I can't even pronounce the name of the riad or its street. I can't place north from south, and even detailed maps are meaningless in the narrow back lanes. My sole wayfinding technique is to stop, look in all directions, take a mental note of the scene, and try to remember how it relates to the last time I recorded my position. I find my way out of the back alley, continue to move. Make mental note. Move. Now, I am on a street that is bustling with life: Smoke from old mopeds, street vendors filling up every free space, chants of prayer, music. Fabrics in hues of honey and saffron drape the ancient sandstone walls. Stop. Make mental note. Move. Day turns to night and I find a restaurant. The waitress seats me at the rooftop terrace, four stories up, where I sit alone under moon and stars. I do not know why she put me up here, away from the other guests, but the view is spectacular. The waitress brings a bowl of couscous flavored with orange and cinnamon. Orange is infused in tea, in chicken tagines, in desserts, appetizers, lamb, even bread. I associate certain tones and melodies with color too. When I hear classical East Indian music, I imagine dark orange; when John Coltrane and Miles Davis play, I hear orange on blue. Grateful Dead concerts from 1977 sound like a warm orange evening captured in music. I can never separate the tangle of sounds from hues of yellowish-orange and orangish-red in my head. The next morning, I meet up with Hicham, a friend of a family friend who drove from a coastal city to act as my driver. I jump in his car and we leave the medina for the outskirts of the city. Many streets are lined with orange trees. "But those are not the sweet oranges that we eat," Hicham says, explaining that they are a type of bitter orange tree typically grown ornamentally because they bear fruit all year long. In a time before cars and street signs, a street like this one would have been the color of pink sand and sandstone, and what would stand out most would be the orange trees themselves. 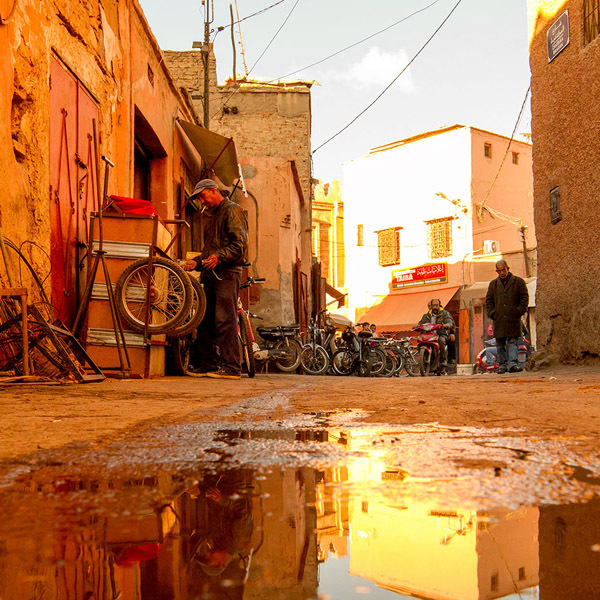 It's a lovely architectural element: orange and green against the subdued natural colors of a Marrakech built from sand and mud. Citrus trees, particularly the bitter orange tree, plays a central cultural role. To understand the role of the orange tree, you have to understand the riad, a traditional Moroccan house with an interior courtyard. 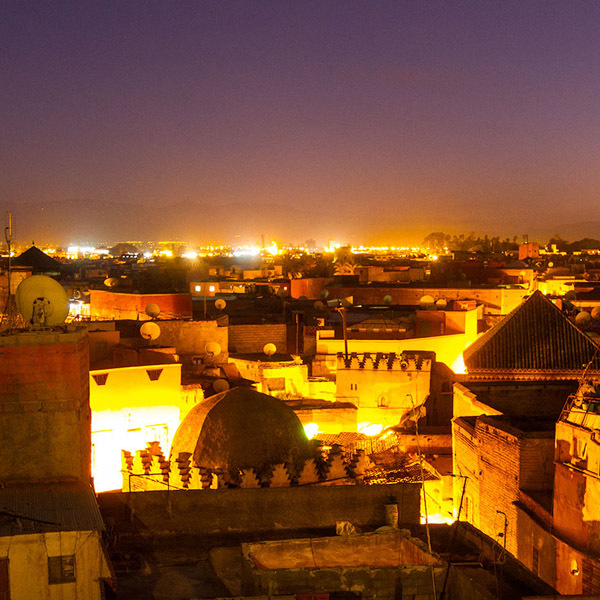 "These days," explains Hicham, "many of the riads in Marrakech have been converted into hotels, but they used to be for private use." Riad architecture derived from different traditional elements: the courtyard blocked the harsh desert winds while allowing in warmth and sunlight. The Islamic concept of the garden, the earthly reminder of paradise, also plays a role in the creation of the riad, at the center of which lives the citrus tree. It may be a single orange or lemon tree, but larger courtyards may host two or three. Everything from the hijab, to hospitality, to weather, to the garden, relates back to the orange tree. Citrus began to appear in North Africa and the Arab world in the first millennium and even surfaced in the Qu'ran. 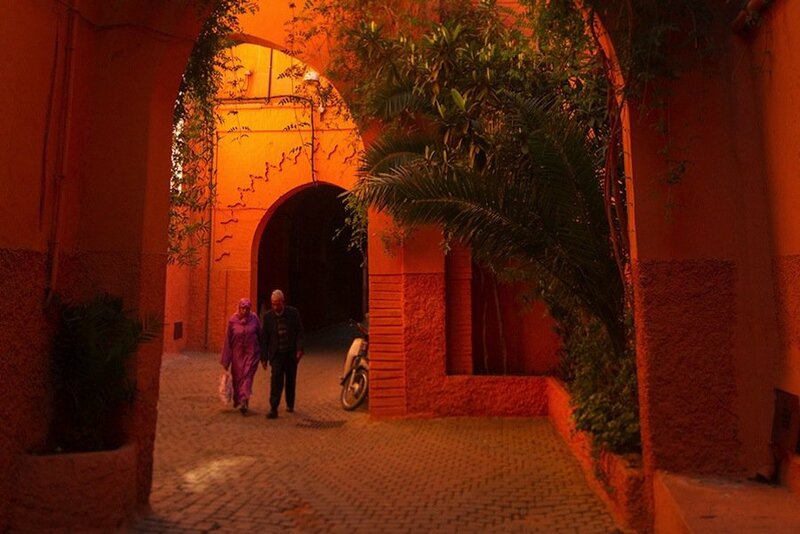 In the defining era of Islamic culture in North Africa, the bitter orange tree must have been something to behold — brilliant and evergreen with bright bulbs of a color so rare in this part of the world. In English, the name for the color comes from the name for the fruit. In the countries of the Far East, the color is named after the spice that is so often used to dye garments orange — saffron. The concept of orange is exalted by Buddhism and Hinduism, and is ever-present in design. For me it's a strange concept; in North America, orange is the least used color in design, fashion, and architecture. It's usually saved for plastics. But perhaps its rarity endears me to it; whenever we use orange, we use it boldly. We know there is something dangerous and bright and optimistic about it. Over the years, I've learned that it's difficult to mix red and yellow paint to produce a big, bold crisp orange. To truly represent orange, you need a naturally occurring pigment. After three days of traveling with Hichan through Marrakech, I sit down on the rooftop of the riad with my Winsor & Newton ink — just brown and orange — and try to capture Marrakech in two colors. For breakfast, I have fresh-squeezed orange juice and pistachio yogurt. I remember a year ago, when the doctor first said that we should try running the color-blindness test on our son again. When we drew together, he tended to use only the colors yellow and blue. We share a plate of pita, hummus and carrots, I ask him to point out the most brilliant color on a plate of hummus, pita, and carrots, and he gestures toward the yellowish garlic. My son will never see orange the way I do. But if travel is about exploring our own themes in our own lives, then a pursuit of the color orange has reminded me that we each see things our own way. Not everybody sees the big, bold optimism that I see in orange, but six billion people each seeing the world through their own eyes is what makes being a part of it so interesting. The full version of this story was originally published on Erik Gauger's blog and was republished with permission. Узнайте про полезный сайт со статьями про аминокислоты купить. Нашел в интернете нужный портал , он описывает в статьях про kamod.net.ua.